Glantre installed fixed bars, lighting, sound, audiovisual and control systems for the new multipurpose hall at King John School. Fixed internally wired lighting bars have been installed over the stage and auditorium. 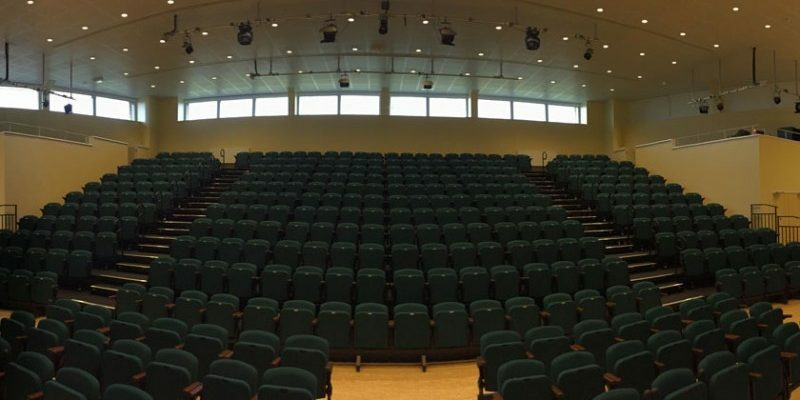 A motorised projection screen has also been installed over the stage area with a ceiling mounted projector and broadcast quality PTZ camera installed over the auditorium. The audiovisual/control system is comprehensive, with facilities to allow events to run in a ‘self operated’ mode for presentations/lectures etc. The system also provides more advanced functionality for ‘technician led’ events. System startup and shutdown are automated via the control system, allowing non-technical users to switch on and operate simple events. Various audiovisual connection points are provided with source selection and audio controls available on a simple touch screen control panel. The technician is afforded far more flexibility, with a separate ‘advanced’ interface on the control panel. The technician is able to preview the video sources at the control position while cueing them up and has complete control over the audio facilities via a Yamaha QL1 audio mixer. Front of house sound is provided by a pair of Yamaha DXR15 loudspeakers installed on ceiling yokes, while portable Yamaha DXR15 and subwoofers can be deployed if required.